I’m a long standing member of the London VMUG (that being the VMware User Group) but I’ve also on occasion been to Virtual Machine User Group (VMUG) meetings as well when I’ve been able to find the time. Panel Debate: Is the cloud secure? Register here, it’s free but spaces are limited. We are an association of persons with a vested interest in the successful deployment of virtual infrastructure and their associated technologies. The committee are all volunteers and are directly employed to manage and design virtual infrastructure in their organisations. Hang on, I’m primarily a VMware virtualization focused blogger aren’t I? Mostly, yes, but there are environments I work on that have other virtualization products installed in them. One of these, a PoC for a project, had a XenDesktop Express installation running in it that had an expired trial license. Citrix License Server currently unavailable. Check the license server and make sure it’s running, then try again. Citrix.Console.Models.CallbackEventArguments.ScriptException Citrix License Server currently unavailable. Check the license server to make sure it’s running, then try again. LicenseServerDownnSystem.InvalidOperationException: License Server is not running. A quick look in the Windows Services tool showed that it was indeed not running. Restarting it only produced another failure and a Windows 1067 error. Just pop that into your browser address bar and download the file. The service will now start again and you can import the correct license file. A lesson in not trying to do several things at once. I had just deployed a VM from a template and waited for it to be customized. All was well until Windows tried, and failed, to activate giving the error code 80072f8f. This was in a new environment in a remote datacenter. Once I started paying attention though I noticed that the VM was set to synchronize time with the host and the host’s NTP configuration had not been made correctly. The VM was running 6 months or so behind the current date. Don’t do too many things at once and forget about the above! Virtual Clarity, my employer, for supporting my attendance here. My wife and family for letting me go almost a week without speaking to them properly! Fira Barcelona – it’s a big space and I’ve heard some people complaining that they’ve had to do a lot of walking but I didn’t come here expecting to sit down all day. The event staff have been good and I thank them all for putting up with so many foreign geeks. Josh Atwell, Damian Karlson and Alastair Cooke for putting on a series of great vBrownbag presentations. All of the speakers for putting together so many great sessions. The vendors / sponsors / solutions providers who make IT great. I didn’t stop at every booth but I had great conversations with lots of them. The event organizers who have spent the best part of a year making VMworld happen. Alex Maier, she may have moved on from VMware but she helped all of the vExperts so much and helped get me here this year. 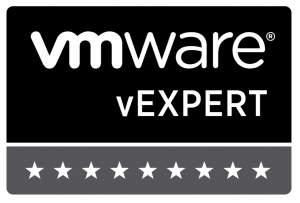 VMware – Thank you for continuing to innovate!